Sony Computer Entertainment Inc. (SCE) has released details about the new PlayStation 3 (PS3 model #CECH-2000A). 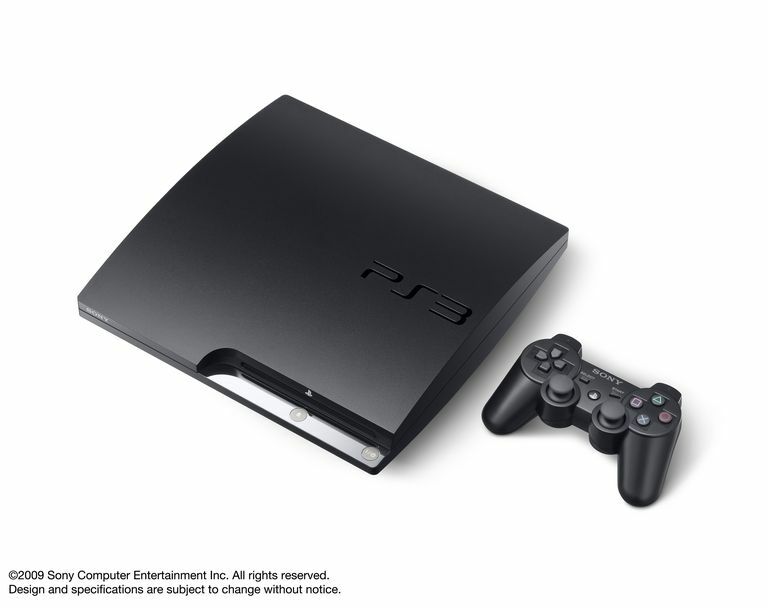 The svelte charcoal black PS3 Slim sports a much smaller case and a 120GB Hard Disk Drive (HDD). The new PlayStation 3 Slim is slated for retail release on September 1, 2009, in North America, Europe/ PAL territories at a discounted retail prices (RRP) of $299 USD and €299. The PS3 Slim will drop in Japan on September 3, 2009 (odd, in that Sony usually releases in Japan first), with a retail price of 29,980 yen (including tax). In a bold move, Sony has discounted the remaining stock of 80GB PS3's to $299 USD from August 18 and €299 from August 19. Also in North America, the price of PS3 with 160GB HDD will be reduced to a RRP of $399 USD from August 18. Of course one has to ask if it isn't worth waiting a couple of weeks to own the new version of the PS3 Slim with a 120GB HDD for the same prices as the 80GB PS3 Phat. What Makes the New PS3 Better? According to publisher, "The internal design architecture of the new PS3 system, from the main semiconductors and power supply unit to the cooling mechanism, has been completely redesigned, achieving a much slimmer and lighter body. Compared to the very first PS3 model with 60GB HDD, the internal volume as well as its thickness and weight are trimmed down to approximately two-thirds. Furthermore, power consumption is also cut to two-thirds, helping to reduce fan noise. While inheriting the sleek curved body design of the original model, the form factor of the new PS3 system features a new meticulous design with textured surface finish, giving an all new impression and a casual look. With the compact body and casual appearance, the newly introduced model will appeal to a wider audience who are looking to buy the best entertainment system for their home." In some ways the PS3 Slim seems like an effort to erase the negative, and long lasting legacy of Ken Kutaragi. From his statements about the PS3 being worth a week's play to the use of the "Spider-Man" font, the smaller, more energy efficient PS3's is not only cheaper, and not only does the emblem on the console looks more reminiscent of the PS2 logo than previous branding, but Sony now writes PS3 "PlayStation 3" instead of the all caps "PLAYSTATION 3" companies and journalists were asked to use. Rather than trying to differentiate it, Sony is placing the PS3 firmly under the PlayStation brand. Sony describes the new PS3 Slim as continuing to provide, "cutting-edge features and functions of the current models, such as the ability to enjoy high-definition Blu-ray disc (BD) movies and games, as well as various content and services downloadable through the network. The new PS3’s storage size has increased from 80GB to 120GB, and with the extra capacity users will be able to store more games, music, photos, videos as well as various content and services available through PlayStation Network. Having more than 27 million registered accounts around the world, PlayStation Network offers more than 15,000 pieces of digital content, ranging from game titles, trailers, and demos to more than 15,000 movies and TV shows via PlayStation Store*1. PlayStation Network members can also download free applications, such as PlayStation Home, a ground-breaking 3D social gaming community available on PS3 that allows users to interact, communicate and share gaming experiences, as well as Life with PlayStation, which offers users various news and information on a TV monitor in the living room by connecting the PS3 to the network." The PS3 Slim is being supported by a number of AAA games headed down the pipe, including Uncharted 2: Among Thieves, EyePet, Ratchet & Clank Future: A Crack in Time, Heavy Rain, God of War 3, MAG, ModNation Racer, Gran Turismo 5 and more. Manufacture's Note: This product (PS3 Slim) is not compatible with PlayStation 2 disc based games. PS3 system software update version 3.00: According to Sony, a new version of the PS3 OS will be available "concurrently with the release of new PS3, system software will be upgraded to version 3.00 on September 1. The update adds various user-friendly features such as the “What’s New” screen, where users can quickly browse the new items available in PlayStation Store as well as their recently played games directly on the XMB (XrossMediaBar), with short cuts to each piece of content. PS3 will evolve continuously with the system software updates, further improving the operability and enhancing the user experience available through the network. PS3 owners will be able to enjoy new features by simply updating the PS3 system software to version 3.00 via the “System Update” function on the XMB." BRAVIA Sync Feature: When hooked via HDMI to a Sony BRAVIA HDTV users will be able to operate the PS3's XMB interface using the TV remote control. A new "System Standby" feature will turn off the PS3 when the BRAVIA TV is powered off. “Vertical Stand” for new PS3 (CECH-2000 series): Unlike the current PS3 Phat, the PS3 Slim cannot stand on its side without help. The vertical stand will be sold separately for $24 USD or 2000 Japanese Yen. Removal of “Install Other OS” feature: In addition to losing the ability to stand on its side, the PS3 Slim will not support the addition of a 3rd party OS, such as Linux. Sony claims that the focus of the new PS3 will be on new games and entertainment content, not computing features. The PS3 Slim's lower price, larger hard drive, and smaller footprint will make it a very attractive option, despite the loss of some functionality. About Sony Computer Entertainment, Inc. Recognized as the global leader and company responsible for the progression of consumer-based computer entertainment, Sony Computer Entertainment Inc. (SCEI) manufacturers, distributes and markets the PlayStation game console, the PlayStation 2 computer entertainment system, the PSP (PlayStation Portable) handheld entertainment system and the PlayStation 3 (PS3) system. PlayStation has revolutionized home entertainment by introducing advanced 3D graphic processing, and PlayStation 2 further enhances the PlayStation legacy as the core of home networked entertainment. PSP is an innovative handheld entertainment system that allows users to enjoy 3D games, with high-quality full-motion video, and high-fidelity stereo audio. PS3 is an advanced computer system, incorporating the state-of-the-art Cell processor with super computer like power. SCEI, along with its subsidiary divisions Sony Computer Entertainment America Inc., Sony Computer Entertainment Europe Ltd., and Sony Computer Entertainment Korea Inc. develops, publishes, markets and distributes software, and manages the third party licensing programs for these platforms in the respective markets worldwide. Headquartered in Tokyo, Japan, Sony Computer Entertainment Inc. is an independent business unit of the Sony Group.